“So, what is your favorite subject? Hope you had fun learning about my school day. Tell me about yours!” exclaimed Paige Travers ’25, an exuberant fourth-grade student on the Short Hills campus. She was just wrapping up one in a series of self-made videos in which she explained, with liberal use of hand gestures, her typical school day, her favorite hobby, and what holiday celebration she most enjoyed. Shortly, the video’s recipient in Kenya, would eagerly receive it and respond in kind with a video of her own. …The opportunity gave our students a chance to learn about another culture, and gave them an experience that taught them empathy for others, as well as an understanding of the design loop. Students were able to work through failure, and see things through a different perspective, unlike anything they had ever experienced before. STEAM week is becoming an increasingly popular concept at schools across the country. Princeton Junior School (PJS) took it a step further last spring by offering an immersive STEAM experience that involved global collaboration. Any chance they get, Pingry Lower School teachers enrich and enliven the learning experience for their young students by making interdisciplinary connections. They have found that projects involving science, technology, engineering, art, and math—or STEAM disciplines—are the perfect vehicle. When second grade teacher Mary Ogden learned that a French teacher at Kent Place was partnering with a global educational exchange called Level Up Village to introduce a STEAM experience to his students while connecting with other schoolchildren abroad, she wanted to try it, too. Pingry’s Educational Technology Specialist, Jill Driscoll, then met with him and picked his brain. It seemed like the perfect program. She jumped on it. In my role of Global Learning Coordinator, I am constantly seeking ways for our students to have global experiences. Girls in the Middle School and Upper School at Kent Place School have many opportunities for global engagement, including several options for trips. Our Primary School students, however, don’t have as many opportunities. Our World Language classes have sister classes with which they correspond via letter or Skype, but I feel like we can always do more. After all, technology has given us new opportunities for communicating with people all over the world. When introduced to Level Up Village (LUV), I knew that by we would have new opportunities that would excite our students about meeting other children from around the world. Sadly, we have finished up our Ugandan exchange. Even though the boys knew the final exchange was last week, it was still sad for the boys to not be starting our week off with a new video letter from their global partners. These girls had become a big part of our classroom routine over the last two months! Today’s classes were very excited to see they had videos from their global partners waiting for them. One young man announced, “I am so cool!” The classes are starting to get the hang of using SketchUp to create items in 3D. But as amazing as that is, they are all much more interested in their video mail! At Delbarton, an all-boys Benedictine School in Morristown, New Jersey, we have been looking for global connections, but struggled with the logistics involved in this kind of collaboration. We decided to pair our 8th grade science students with an all-girl’s school, and see what happens. So far, the results have been amazing. 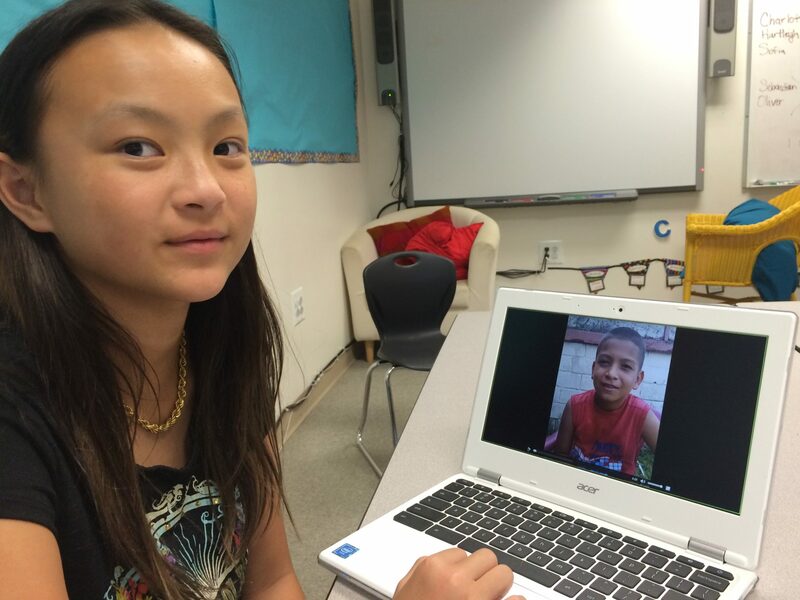 Our 8th graders sent video introductions to an all-girls school in Uganda yesterday. Let us just let the reality of that settle in for a moment.